To begin you will need to cook your pasta. Of course you can cook it the traditional way, but I am OBSESSED with making my pasta in my Instant pot! To cook in the instant pot pour in the pasta and 4 cups of water into the insert. Place the lid on the instant pot with the valve set to SEALING, and cook on MANUAL for 5 minutes. When it is finished cooking turn the valve to VENTING and do a quick release. Your pasta is perfectly cook and, in most cases, no drain is needed. While the pasta is cooking you will need to combine the pasta sauce, diced tomatoes, cream cheese, basil, salt, and pepper in a sauce pan. Place over medium/high heat and bring to a simmer. Simmer until the cream cheese has melted into the sauce. 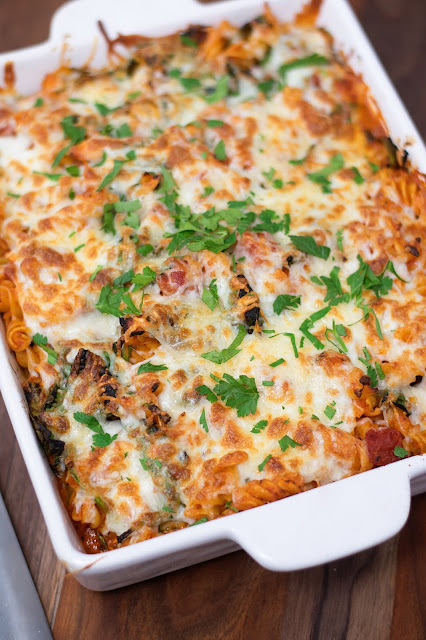 Now in a large bowl stir together the cooked pasta, sauce, spinach, chicken, and HALF of the mozzarella and Parmesan cheeses. I realize I didn't show how I cooked the chicken. That's because one thing I like to do at the beginning of the week is cook a large batch of chicken in my, you guessed it, Instant pot (I swear this is not sponsored lol) so I have it on hand for quick recipes just like this! Some of my other favorite ways to prep the chicken is in my crockpot, boil it, or bake in a 375 degree oven for 20 minutes. 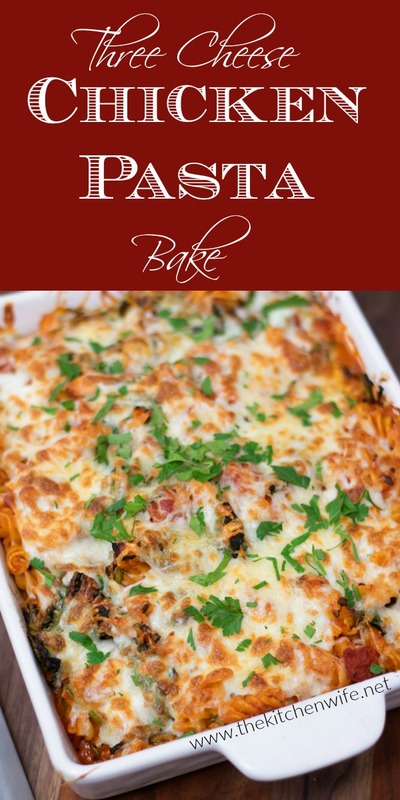 Pour the pasta mixture into a greased baking dish and place in the preheated oven for 20 minutes. Return to the oven and place under the broiler for 2-3 minutes to get brown and bubbly. Look at how gorgeous and yummy that looks! I like to top this with some fresh chopped basil or parsley and it is time to eat! This Three Cheese Chicken Pasta Bake is a healthy and delicious meal that is perfect for any weeknight! I like to serve it with a nice garden salad or some steamed broccoli. 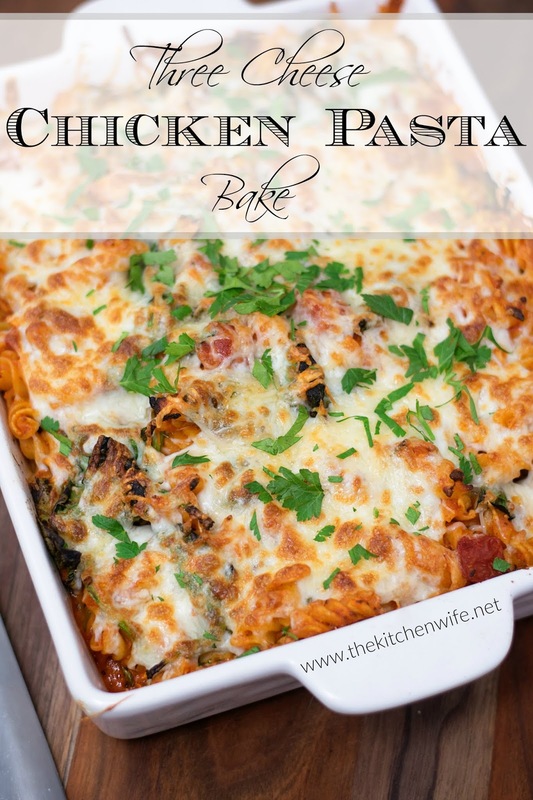 It's sure to be a family favorite so get in the kitchen and make it TONIGHT! This Three Cheese Chicken Pasta Bake is a healthy and delicious meal that is perfect for any weeknight meal! In a sauce pan combine the pasta sauce, diced tomatoes, cream cheese, basil, salt, and pepper. Bring the sauce to a simmer and cook until the cream cheese has melted into the sauce, about 5 minutes. 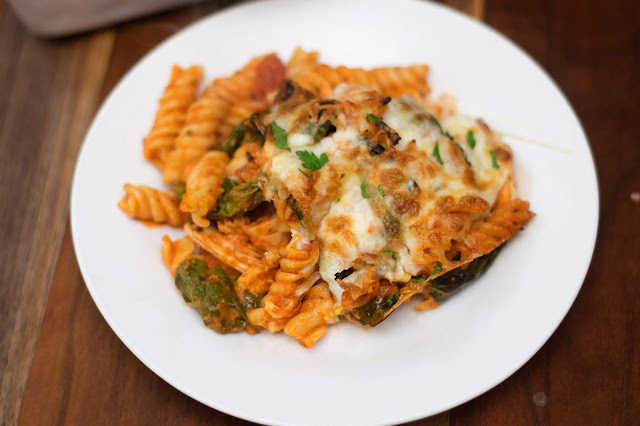 In a large bowl combine the cooked pasta, chicken, spinach, sauce mixture, and HALF of the mozzarella and parmesan. Pour into a greased baking dish and baked in a 375 degree oven for 20 minutes. After 20 minutes, remove from the oven and add the rest of the mozzarella and Parmesan cheese to the top. Place under the broiler for 2-3 minutes until brown and bubbly. Place the pasta and 4 cups of water into the insert. Place the lid on the Instant Pot and set the valve to SEALING. Set the Instant Pot to MANUAL for 5 minutes. Allow to come to pressure. After the 5 minute cooking time has elapsed, turn the valve to VENTING and do a quick release. The pasta is fully cooked and ready to go. Serve with a garden salad or steamed vegetables.